I know more about cosh* than cohosh. That said, on the way back home from the Midwest we stopped for a couple of nights in Bentonville, Arkansas, to visit the Crystal Bridges Museum for a second time, and on the museum’s landscaped grounds on June 20th I photographed some appealing flowers and buds of black cohosh, Actaea racemosa var. racemosa. The genus name was formerly Cimicifuga, which means ‘makes bedbugs go away,’ and an alternate common name is bugbane, but whether black cohosh really has that property, I don’t know. If you’re interested in the craft of photography, I’ll add that in taking this picture I made good use of point 4 in About My Techniques. 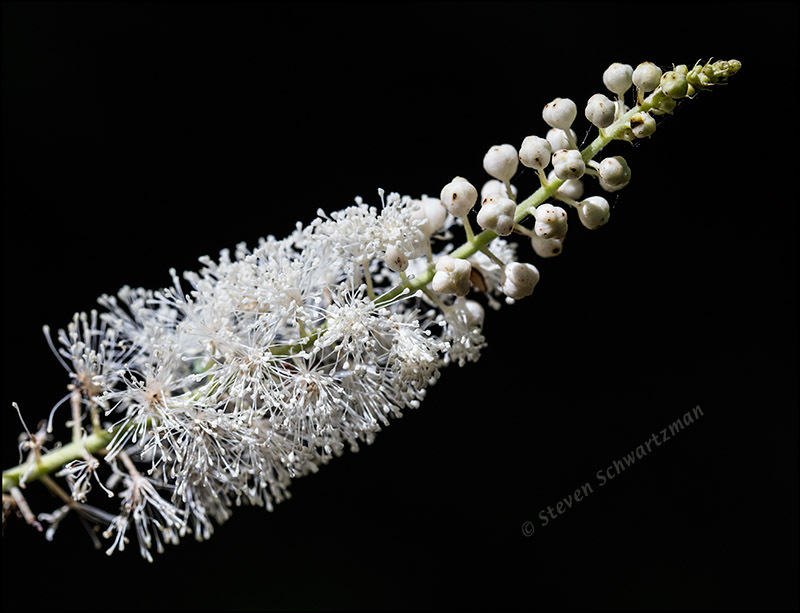 The fact that a shaft of sunlight illuminated the black cohosh inflorescence amplified the contrast between black and white. Points 1, 2, and 18 also came into play. * In trigonometry, cosh is the hyperbolic cosine. Steven, as always a most beautiful photograph of such a lovely little flower. I in particular like the white against the black background. This species was new to me, and as it doesn’t grow in Texas I wouldn’t have known what it is, except that little signs on the grounds of the Crystal Bridges Museum identified some of the plants. The way the white flowers and buds lit up in the sunlight made me have to take pictures. I can see why you felt compelled to photograph this one. It’s beautiful. Seeing only the smooth buds, I’d never have expected so much frilliness. I’ve never seen the plant, but I’ve heard of it through a friend who’s interested in herbal remedies. So many health claims have been made for black cohosh (some hyperbolic themselves) that the species has declined in some areas due to habitat loss and over-harvesting. Illinois was mentioned in several articles as a place where the plant’s become less frequently found, but it’s not on their official lists. I didn’t know until I found the Illinois lists that Texas also has lists of threatened and endangered species by county. The site’s full of information, and fun to use. Where you see frilliness (good word), I imagined fireworks. Thanks for that link to the site with endangered and threatened species in Texas. I looked at the plants listed for Travis County and recognized the names of some species I’ve been fortunate enough to photograph. Given all the time I’ve spent wandering in nature, I expect I’ve seen some of the others, too, without having had any idea what they were. I like your reference to hyperbolic claims. That’s safer territory for most people than hyperbolic trig functions. I’ll eschew the former and revel in the latter—and that’s no exaggeration. I was good at trig. Used it a lot teaching physics. SOHCAHTOA to you. I have bugbane in my garden that seems to thrive under almost any condition; love the photo you included in your post. I see there are different species and even genera that share the common name bugbane. Do you know which species you have? I’m fond of this photo too. Thanks, and happy checking of those techniques. Aren’t these lovely to photograph? Always graceful. I grow them in my garden as a native plant beloved by pollinators. Another common name is snakeroot – if you ever dig one up, you’ll see how it got that name – long horizontal roots all growing in one direction. Black cohosh is also used in herbal remedies. It’s great that you live in a region where this plant is native so you can enjoy it all through its growing season. I see that its territory includes Long Island, where I grew up, but I don’t remember it. Thanks for the explanation of why people call it snakeroot. Because black cohosh doesn’t grow anywhere in Texas, I’ll have to limit myself to real snakes. I always enjoy finding flower spikes like this with plenty of unopened buds to hint at the soon to be flowers as seen below. Nice. It was indeed a good mix between flowers and buds. That was my one day with this species, so I never got to see the buds open.